All summer long, California spiny lobster carapaces wash up on the beach along Malibu, as the lobsters shed their old exoskeleton and grow new, larger shells. Research indicates that these slow-growing arthropods require seven years to reach "legal" harvesting size. 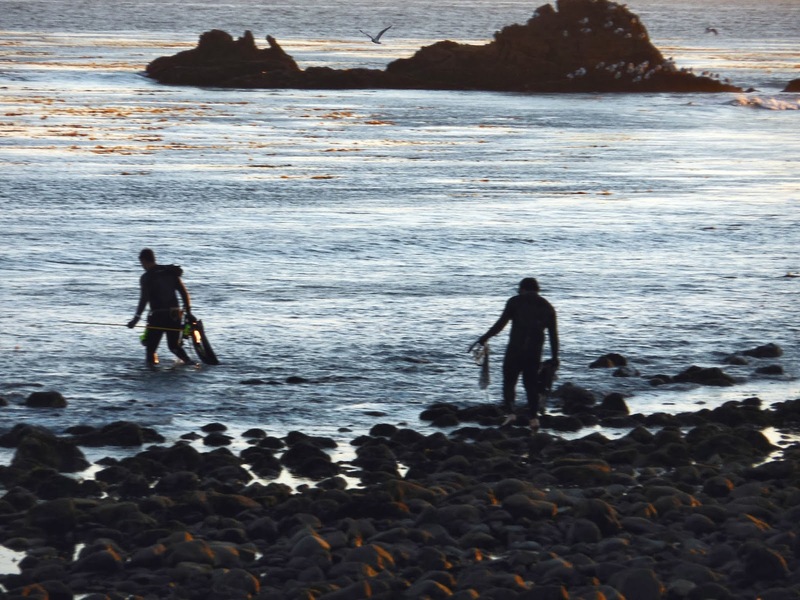 They're off limits to humans during the summer months but one of the sure signs that autumn has arrived is the sight of floats materializing along shallow rocky stretches up and down the Malibu coast like mushrooms after a rain. Lobster season got underway in Southern California on Sept. 28 this year. There were so many floats in the water at Deer Creek during the first week that its a marvel there were enough lobsters to go around. The commercial fishers aren't the only ones dreaming of lobster. 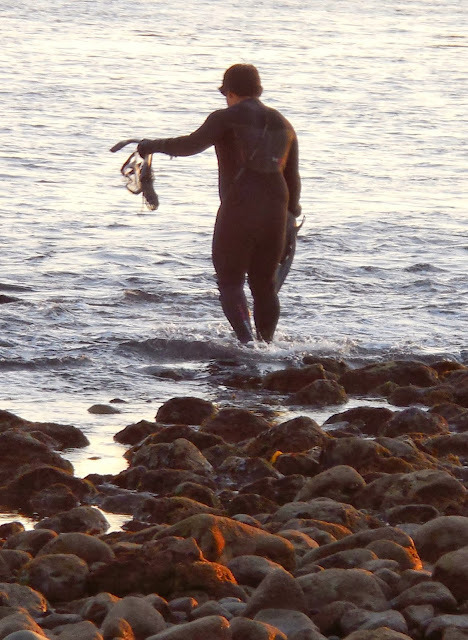 Divers equipped with lobster hoop nets are a common sight at beaches like Leo Carrillo and Nicholas. Spiny lobsters may be taken only with the nets or by hand. Anyone diving or fishing for lobsters must have a valid California fishing license, a special spiny lobster report card and a measuring gauge to make sure their lobsters are legal size. According to the California Department of Fish and Wildlife, "Daily bag and possession limits are seven lobsters per person and each lobster must measure a minimum of three and one-fourth inches, measured in a straight line on the mid-line of the back." Longtime residents say that lobsters aren't as big or as numerous as they used to be—anecdotal evidence relates stories of flocks of eight-pound giant lobsters at Point Dume—today 1.5-2 pounds is typical. While recreational divers may anticipate dining on lobster tail—spiny lobsters don't have big claws like their Maine cousins, most of the commercial catch is shipped to Asia, according to the DFW, which estimate that 695,000 pounds (316 metric tons) were caught during the 2009-10 and 2010-11 seasons. Commercial fishing peaked in the 1950s, and the DFW is in the process of developing a management plan for the fishery, which has been plaguing with issues like "short stock" —lobsters that are too small and are taken illegally, and traps that are illegally wired shut, so undersized lobsters and other bycatch can't get out. Humans aren't the only ones with a taste for lobster, sheepshead, sharks, and octopus all pray on lobster. They are also a favorite food of the California sea otter, and with the sea otter missing from so much of its former range, the spiny lobster has reportedly taken over an important ecological role from its former predator: keeping the sea urchin population in check, which helps to maintain the health of the kelp forest. Every now and then the arthropods get their revenge. 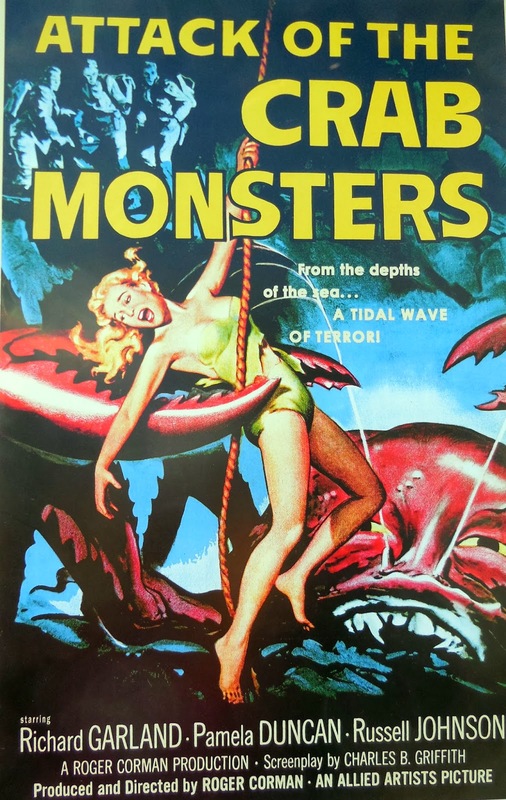 I can never watch divers at Leo without visualizing scenes from the 1957 Roger Corman film Attack of the Crab Monsters. 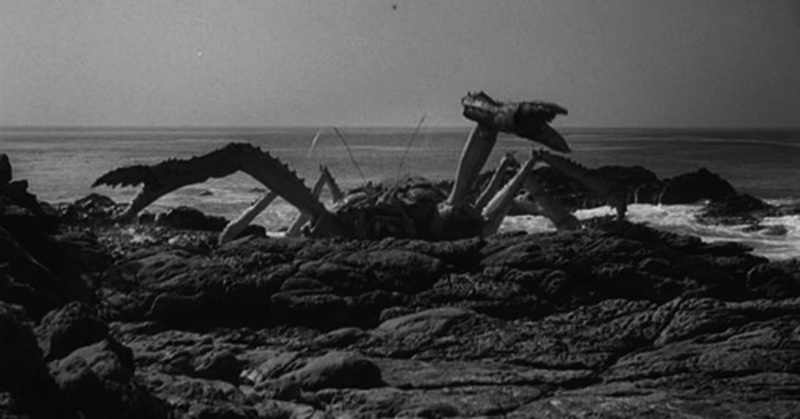 Corman, the king of Z-grade budget horror, dreamed up a monstrous, radioactive crab that wrecks havoc on hapless humans, after climbing out of the sea and onto the rocks at Leo Carrillo. "From the depths of the sea, a Tidal Wave of Terror!" the tagline states. Unlike the California spiny lobster, Corman's crab monster is equipped with impressive front claws. It also speaks in an ominous booming voice, and uses its radioactive powers to melt rocks and cause earthquakes—not something one usually encounters in crustaceans. Corman's crew had the herculean task of moving this vast, rubbery monster out onto the rocks and then animating it with the aid of rods and wires. The Crab Monster menaces the obligatory assortment of scientists and scantily clad women with a kind of ponderous gravitas, monologuing gravely about the evils of nuclear power before meeting its end. The rocks, located just beyond the famous Leo Carrillo sea cave, are fully accessible only at low tide. They're volcanic rock, that manages to be both sharp and slippery at the same time. Ingenuity was required to get the shots. You can watch the trailer or the whole film on YouTube. And then you, too, can think of the Crab Monster whenever you see divers heading out with hope and round nets to catch an arthropod for dinner. The Crab Monster from Roger Corman's "Attack of the Crab Monsters" is definitely not a "short" catch, and good luck landing this pretty in a hoop net.